Chiropractic therapy is the science of locating and correcting misalignments of the spine, called subluxations. Such misalignments cause the vertebrae to compress, which interferes with the nerves that travel from the spinal column throughout the body. At each vertebrae, nerves run from the spinal cord to specific organs and tissues of the body. These nerves then tell the tissues and organs how and when to operate. If subluxation of a joint has reduced the joint´s mobility and compressed the vertebrae, the effects on the nerves can range from simple inflammation to largely impeded functioning (sometimes resulting in a "pins and needles" sensation in a specific area of the body). If the function is sufficiently altered, spasms, pain, weakness, fatigue, immune system imbalance, and other imbalances occur. Our animal chiropractor, Dr. Anna Crane, is trained to locate subluxation and to exert a measured "thrust" or pressure into the proper plane of the vertebrae that is involved in the misalignment. The thrust, or adjustment, allows the joint to move freely so the decompressed vertebrae can in turn allow the nerves to do their job. Dogs that receive routine chiropractic care tend to be healthy, relaxed and energetic, with a decreased risk of arthritis and disease. Chiropractic care should be used in conjunction with traditional veterinary medicine, not instead of it. 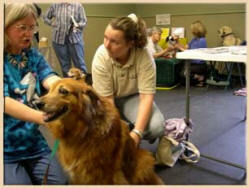 We ask that your veterinarian provide a referral in order for your pup to receive care at The Doggie Den. Our fee for a 30-minute session is $40.00. To contact us about Chiropractic treatments, fill out the wellness appointment request form. To schedule Chiropractic Treatments with our animal chiropractor, Dr. Anna Crane call us at 508-393-6970 or use our online registration form.